The Far Cry series has come a long way since the days of Jack Carver and genetically engineered monsters. He was a game protagonist from an earlier time. He had a dark ex-military past, his goal was to rescue a damsel in distress, and the islands where he plied his trade existed solely to serve the the relatively novel for the time open-world structure of the missions. However, in Far Cry 2, Ubisoft decided that the real star of the game should be its setting. What we got from that was a game with many possible protagonists; an attempt at a socially conscious story involving African genocide, arms dealing, and blood diamonds; and a wonderfully atmospheric African setting. There was a functioning ecosystem, day/night cycle, and varying weather. The setting was the star of the show, but the gameplay never quite achieved the same degree of quality. Far Cry 3 pulled it off, however. Rook island was a fantastic setting with real personality, full of interesting things to do. It had a villain for the ages: Vaas. He was a man whose specific brand of insanity was so compelling you couldn’t look away whenever he was on the screen. That game’s protagonist, trust fund brat Jason Brody, even managed to find a character arc which is a rare achievement for a videogame. That takes us to Far Cry 4. It’s the third iteration of the, what I’m going to call, “setting first” Far Cry games, and it’s coming on the heels of my favorite FPS of that entire console generation. 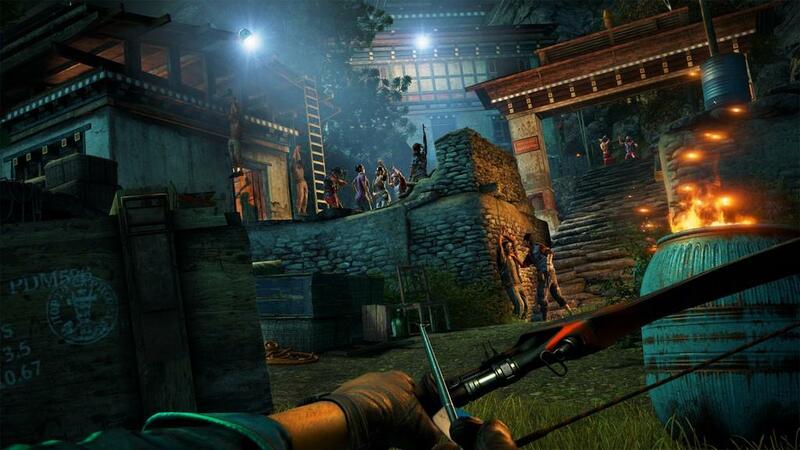 First of all, let’s just get it out of the way: Far Cry 4’s setting is as wonderful as it appeared like it might be when it was first announced. The Himalayan nation of Kyrat is densely packed with stuff and it all looks gorgeous. It comes in 3 loosely defined districts: the lowlands, the midlands, and the highlands. Also, several missions take place in areas simply called “The Himalayas.” These are high in the mountains and feature terrain like you’d expect, namely snow and wind. Some even require protagonist Ajay Ghale to find an oxygen mask and collect filters for it like in Metro series (don’t worry, it’s not an intrusive or obnoxious gameplay element). So who is Ajay Ghale? He’s no trust fund baby, that’s for sure. He is the fully Americanized son of Mohan and Ishwari Ghale. They founded the Kyrati rebel organization known as the Golden Path, then his mother fled with him to America. Ajay knows none of this, so when he travels to Kyrat to scatter his mother’s ashes and his bus is waylaid by soldiers he has no idea why. Why is revealed soon enough when a helicopter lands and Pagan Min steps out to whisk him away from the growing battle. Pagan Min is the king of Kyrat and he knows who Ajay is and why he’s in the country. He also implies a romantic relationship with Ajay’s mother from long in the past. Ajay escapes from Pagan before things get too weird and soon enough hooks back up with the Golden Path and finds himself in a fight against Pagan Min. That’s the story in a nutshell. To talk about it anymore might get too far into spoiler territory. I will talk about the characters, starting with Pagan Min who is in full Vaas mode for most of the game. That equals funny, crazy, and compelling in my book. He’s definitely memorable, but his shock of platinum hair and pink suit accomplished that back when the game was first announced. He’s definitely not what you think of when you think of “Central Asian monarch.” The rebel leaders, Sabal and Amita, don’t fare as well. Their performances are compelling but their motivations are less interesting that Pagan’s and Ajay’s. Pagan’s lieutenants fare even worse. They don’t even get enough screen time and often it seems like story content relating to them was cut for some reason. There is a lot of unearned subtext in Ajay’s dealings with Pagan Min’s four top advisors and that’s disappointing to me because they’re superficially very interesting. Luckily, there are lots of gameplay reason to play Far Cry 4, especially if you liked Far Cry 3 since they are basically the same. The map is roughly the size of FC3’s Rook Island but far more densely packed with far larger elevation differences. I feel like it’s probably the game’s modest size that allows such a high graphical fidelity even at extreme distances. Never once does it feel like the graphics are stretching the game engine to its breaking point despite the fact that Far Cry 4’s graphics are excellent. Mission and side quest structure is identical to FC3. You will go to a spot on the map, recieve an objective, travel to its location, and proceed to complete it anyway you see fit. You can pick off enemies with a sniper rifle, stealth kill them one by one, fill the area with fire or explosions, or use the game’s new-to-the-series bait to lure predators into the area. Of course the best way is to ride in on the back of a majestic pachyderm like some sort of Pleistocene megafauna version of Daenerys Targaryen. It’s not exactly fire and blood, but you can trample enemies or toss them with your mount’s trunk. You also have full access to your weapons from elephantback. Blowing dudes up with explosive arrows from the back of an elephant that just flipped an enemy technical is exactly the sort of emergent gameplay Far Cry thrives on. 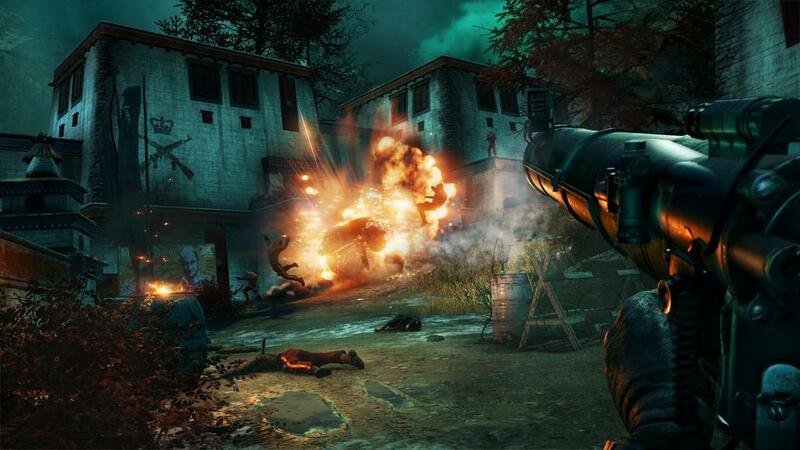 Crafting makes a return in Far Cry 4 as well. It’s a tad simplified and the interface is much cleaner and intuitive. I still don’t like that you begin with one weapon holster unlocked and can only carry a tiny amount of ammo so you have to spend the early part of the game hunting just so you can play the game properly, but it still isn’t a deal-breaking problem. At least this time around if you kill an animal with an arrow, crossbow bolt, or knife, you get a “clean kill” which nets you double the amount of hides to craft with. On the other hand, if you go tiger (or any animal, for that matter) hunting with landmines or other explosive (so much fun, guys…) you will only pull a damaged skin from the corpse that you cannot craft with at all. Syringe crafting has also received a major interface upgrade. It’s now so easy to do, I began accidentally injecting myself with potions to aid in hunting humans and animals, performing bursts of speed and extended stints underwater, shrugging off damage, becoming harder to shoot, and increasing damage output at the expense of heightened damage taken. The whole syringe boost system is much more well-integrated into the gameplay this time around. The XP and levelling up system makes a return also. It’s been pared down a tad probably for the better. Far Cry 3 really had a problem with how it’s skills, beyond takedowns, didn’t really affect gameplay very much. This time around, instead of fixing them, they simply removed many of them. I guess sometimes you just have to cut out the rot so you can save the limb. The only really new ideas revolve around skills that can be “learned” up to ten times and offer incremental increases to, for example, how long syringes last. Traversing the world, much like the rest of the game, has remained largely the same save for two important new features. You still can walk, drive, boat, and hang glide; however, now you can fly small gyrocopters and fire a one-handed weapon while driving or flying. Not only that, but with the click of a button, you can activate the new auto-drive feature that keeps your vehicle on the road and traveling to your waypoint while you aim and shoot. It sounds great, but it was almost always easier to simply barrel through or over enemies, get out and deal with them, or hop in my truck’s machine gun. You’ll also find yourself using the new grappling hook in your travels. You can use them to climb up and repel down cliff faces and swing, Luke Skywalker-style, over gaps. The whole system has really been integrated into the game at large thanks to grappling hook “puzzles” that pop up on a regular basis during missions and are essential when climbing the bell towers that replace FC3’s radio towers and, just like last time, reveal areas of the map and unlock free weapons once activated. 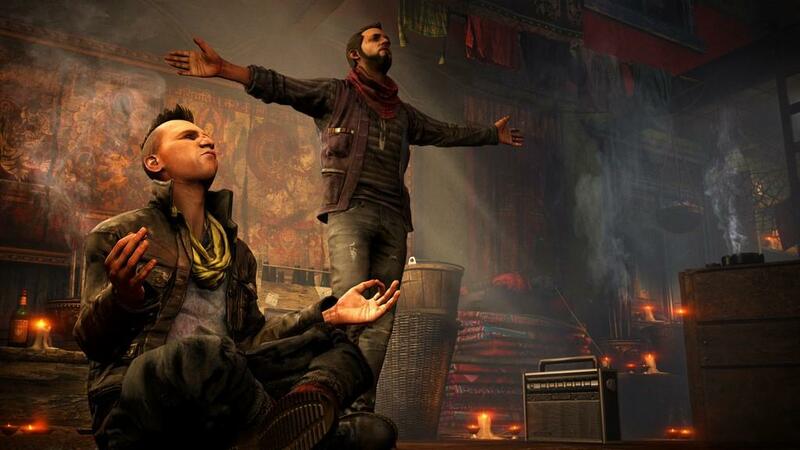 Really, there’s not a lot to complain about in Far Cry 4. Maybe the halving of the number of story missions, and shoehorning in drop-in drop-out co-op are causes for concern but they just don’t hamper the game as much as I wish they did. That way I could get all indignant and ragey about the dwindling nature of the singleplayer while the multiplayer returns in full force with everything you’d expect including the expected map editor and the aforementioned co-op. The co-op is even harder to hate because if you bought the game you, you get ten co-op keys to give away to your friends that allow them to play with you without even owning the game. That is a sweet feature. Far Cry 4 is just a sweet game. There’s lots to do. Most of it is fun even if most of it isn’t really new if you played FC3. It looks and sounds great. Kyrat may be a fictional nation, but it was a brilliant choice to set the game in because it’s unique to videogames. Far Cry 4 doesn’t differ from Far Cry 3 greatly aside from it’s obviously brand new story and setting and that’s just fine for me. 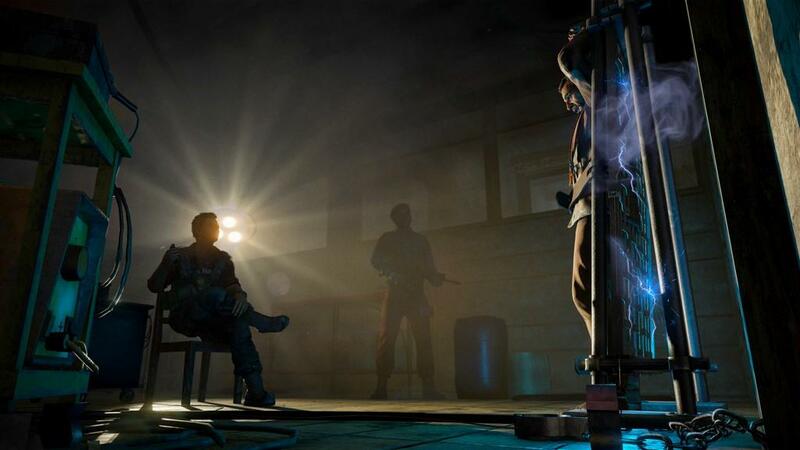 The series has become the first-person shooter for a fan of singleplayer-geared first-person shooters like me. Simply setting off into the bush on foot is as thrilling and fraught with potential as any game I’ve ever played. Every second really is a story, as per the game’s marketing tagline. For once, the suits got it right.